Dogs, especially puppies, explore the world with their mouth. Chewing is totally natural behaviour, which also has a calming effect. When your dog, however, starts chewing on dangerous, expensive and other inappropriate items, it becomes a real problem. Dogs are likely to start chewing on everything that fits into their mouth for a number of reasons that include loneliness, boredom, separation anxiety, fear, phobia, teething in puppies, and others. Ideally, you shouldn't deal with the consequence (chewing) only, you should also address the underlying behaviour problem. How can I prevent chewing? It is always easier to prevent the problem instead of dealing with an old habit. Provide your puppy with a lot of chewing toys. Correct its behaviour whenever it starts chewing on inappropriate objects. Make it clear for your dog that chewing is only allowed on the toys. Puppy proof your home. Put away shoes, socks, and other items you don't want to be destroyed. Never give your dog old shoes or clothing to chew on. It won't know the difference between an old and a new sock! When you're away, keep your dog in a crate so it doesn't feel lonely and abandoned, and therefore isn't motivated to chew excessively. Make sure your dog receives a lot of daily exercise, both physical and mental. Don't forget about obedience training, which is a very effective way to prevent many behaviour issues. 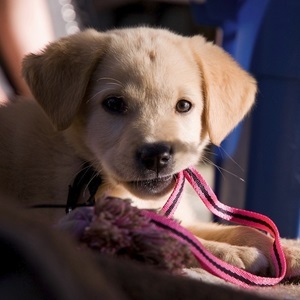 If your dog has already developed the unwanted habit, the following tips should help. • Make your dog's favourite chewing items taste bad. Coat them with bitter apple, cayenne pepper, tabasco sauce or any other non-toxic substance. This approach, however, doesn't deal with the underlying problem, and your dog may start chewing on other objects. • If you catch your dog on the chewing act, say a firm 'No!' in a loud voice. Use the "drop it" and "leave it commands if your dog knows them (if not, train your dog these commands). If your dog stops chewing after your command, reward and praise him or her immediately. Always use lots of positive reinforcement for good behaviour and no reinforcement for bad behaviour. If your dog doesn't stop chewing after your command, do not try to take the item by force because it can be dangerous with some dogs (see obsessive dog behavior). Besides, the dog's chewing habit will be reinforced if you don't succeed to take the item away. Instead of trying to take the object by force, offer your dog an appropriate chewing toy. You may want to coat it with something tasty to entice your dog to free its mouth and take the offered object. If your dog does it, praise and reward it profusely. • Obedience train and discipline your dog; work on becoming your dog's pack leader. This helps form strong bonds between you and your dog that are based on trust, mutual respect, and proper communication. As a result, behaviour problems should grow less. • Be firm, patient, consistent and persistent.